Alicante capital of Alicante prov., SE Spain, in Valencia. A Mediterranean port, it has exports of wine, oil, cereals, and fruit from the fertile surrounding region. Metallurgical and chemical industries together with fishing and tourism are important to the city. The Romans had a naval base on the site. The town was permanently recaptured from the Moors c.1250. Located in the city's marine complex, El Puerto boasts magnificent sea views, and, with its wide promenades is a bustling place at any time of day. During the summer months July and August, the plaza del Puerto Viejo stages an International Festival offering world-class recitals of classical music and jazz , as well as theatre and ballet performances. Alicante is one of the fastest-growing cities in Spain. 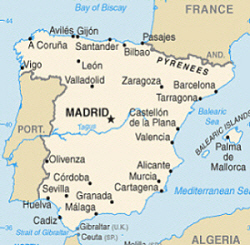 Its economy is based upon tourism from the beaches of Costa Blanca coast, wine production, services and administration. It exports wine, olive oil, and fruit, and has light industries, including food-processing, leather, textiles, and pottery. turrones (torrons in Catalan) —a honey and almond nougat is a food specialty of Alicante. The evocative atmosphere of some of these venues, located in ancient houses with attractive facades is the ideal place to enjoy live performances, mainly jazz, and art exhibitions. Streets like calle San Isidro, calle San Pascual, calle Labradores and calle Cienfuegos, as well as squares like Plaza Abad Penalva, Plaza San Cristóbal, Plaza de la Santísima Faz and Plaza Quijano and their surroundings are the centres of the city's lively nightlife.